All very worthwhile visits and certainly mentions of Gunn families along with the lots of local information in places. 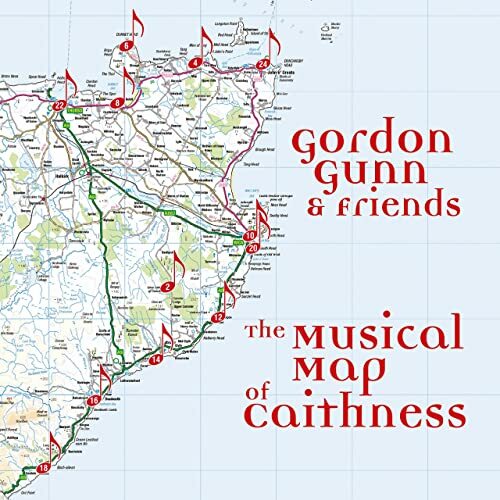 There is also a music album called The Musical Map of Caithness by Gordon Gunn & Friends. It’s available from a number of sources including iTunes [CLICK HERE] and Amazon [CLICK HERE] as well as a host of local outlets including the Heritage Centre. It takes you through a number of local attractions with narration and music to give you the real feeling of bygone Caithness. It’s a beautiful piece really! Well worth listening to as part of any travel planning! The base of a small tower built by the Cheynes in the 14th century, or the Gunns in the 15th, lies on a rock above the river Thurso in a lonely position far inland. On the summit of a crag by the western bank of the River Thurso in a remote and barren area south of Halkirk, are foundations of a tower built by Donald Cheyne. It measures 9.5m by 6.5m with walls 1.6m thick. 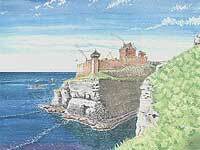 It had a courtyard on the south-east, measuring 13m by 7m, which had only a parapet to defend it. In 1464, Dirlot was held by George, chief of the Gunn clan, but it was held by Alexander Sutherland at the time of his execution in 1499, for killing Alexander Dunbar. 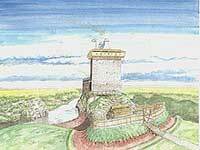 The castle was subsequently granted to the Clan MacKay by King James IV of Scotland. 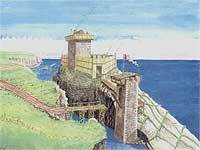 In a difficult to access site on a rock by the shore are the foundations of a tower built about 1500 by the Gunns. A rock which is almost an island at high tide has sheer cliffs on all sides except to the west, where there is a steep slope up from the beach. At the summit was a wall near the remains of which are footings of a tower house, measuring 11.3m by 7m, with walls about 1m thick. At the neck of a coastal promontory is the base of the 15th century tower house of the chief of the Gunns. This site has a long narrow sea inlet isolating it from higher ground on the mainland. Across the neck is a ditch, 10m wide and 2m deep, which presumably one had an inner wall or bank and stockade. Close behind the ditch are grass-covered foundations of a tower house, measuring 13.5m by 8.3m. It was probably in existence by the mid 15th century, when George, chief of the Gunn clan had a residence there.